In recent years race radios have been a key part of team tactics in the big races, many times we’ve seen riders cup their ears to better hear a message relayed from the team car. Now in-race communications will be banned for all road races in 2015 according to a new UCI rule. All change? Or just a new round of protest between the teams and the UCI and a test of authority for President Brian Cookson? Update: radios won’t be banned. The UCI is promising to update the rulebook early in the new year and radios will once again be allowed. 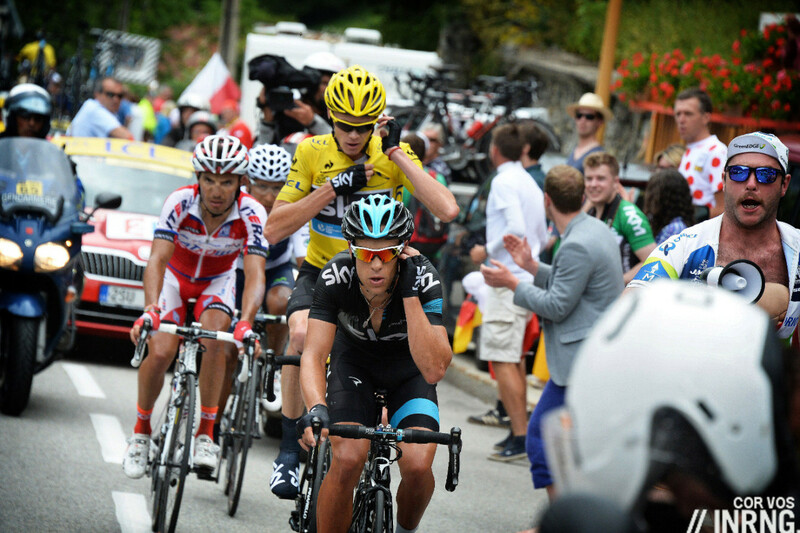 Race radios are two-way radio devices allowing riders to communicate with a manager in the team car. Carried in the jersey pocket or a pouch on the shorts, they allow for safety communications and tactical instructions during a race. They first appeared in the early 1990s where the Motorola team was the first to employ them. The idea is that riders can be warned of a danger, told about rising crosswinds or encouraged to go “full gas” by the team manager. Managers can also instruct riders to chase down breakaways and, with more information from a team car via the commissaire’s radio course and television coverage, the chase has been able to dose its effort to catch a breakaway just at the right point. This frustrated French television executives as ratings fell for the flat stages where inevitably a break of no-hopers would go up the road knowing they’d gain little more than tired legs and TV airtime for their sponsors. Some call it a suicidal break but writer Daniel Friebe describes this tactic as a “commercial break”. That’s Pat McQuaid in a letter sent to riders in 2011 explaining why the UCI wanted to ban radios. In retrospect the prospect of dull processions across featureless landscapes is another factor catering ratings and ASO has moved to spice up the opening week with hilltop finishes and cobbled chaos, but that’s another story. The UCI’s ban met with resistance from some pro teams and ever since there’s been a compromise: they’re banned from all races except World Tour races, women’s World Cup rounds and all time trials. At times the team protest was about more than the radios, it was an issue on which some team managers decided to push back at the UCI in order try and ensure they have a say in how the sport is run. It became a Trojan Horse topic with teams even threatening to boycott World Tour races unless the UCI gave in. A farce in public with behind-the-scenes menaces. The red ink marks the change since the last set of rules and the rules above date from their approval at the last UCI Congress in September, presumably that’s why they specify during 2014, ie for the remainder of the season after the rules came out. But that’s it, the rules now state they’re prohibited in 2015. The UCI has tried to ban them only for the teams to use them in defiance or to make protests. For example in 2009 14 teams rejected a trial during a stage of the Tour de France to race without radios, soft-pedalling most of the way: teams were happy to take the protest as far as the Tour. There are several other examples too. Faced with these protests the UCI relented. Now it’ll be interesting to see what happens at the Tour Down Under in January. Will new UCI President Brian Cookson back down or take a stand on the rulebook? Cookson’s consensual style seems to suggest he’ll listen to both sides and mediate rather than go for the clash method celebrated by his predecessor. With this perhaps the rule gets rewritten and radios are allowed once more. But can Cookson afford to do this? He’s put his name to the new set of rules and being seen to roll-over won’t help the image. Second is the political aspect. Push back the UCI on radios and teams show they can break any rule they like. The rulebook goes from being the legitimate definition of cycle racing towards a code, an à la carte menu where teams can pick and choose the bits they like. Radios have been in use for a quarter of a century now but the UCI has moved to ban them. This isn’t a Spanish Día de los Inocentes wind-up: I gave it a mention in the Christmas Quiz a few days ago (answers here) but the topic, ranging from tactics to politics, merits a bigger explanation and generated some interest by email. Early attempts to prohibit radios met with protests by the teams and some riders and a compromise solution was reached where the continued use of radios was allowed in World Tour events. Now the rulebook says they’re banned for every road race in 2015. What will the teams do? 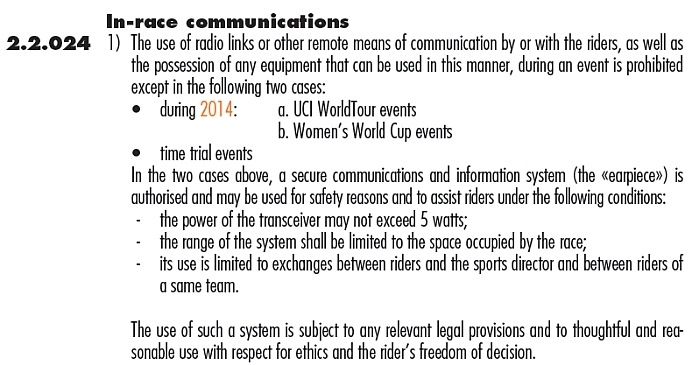 Update II: Radios will be allowed in 2015 on the same basis as 2014, in World Tour, Women’s World Cup and Time Trials. I’m told the UCI rulebook will be amended to reflect this early in the new year. So a vintage typo in the rulebook or did this piece above provoke discussions? It seemed odd that it sat in the rulebook for months. Race radios have NO place in bike racing, they make racing a never ending dull and predictable bore. Their only use is to artificially inflate the egos of DSs, who feel the need to show their importance. If race radio use is supported on the basis of ‘safety’ by teams, one of the most abused and misused words in modern vocabulary, then the single real ‘race’ radio can be used to impart the information, most of which will be available in the race manual anyway. Good riddance to one of the most disruptive influences to be introduced to bike racing, second only to the doping problems. I for one hope the UCI shows some resolve in this matter. There are arguments both ways but for me it’ll be interesting to see the argument over the ban: do teams do anything or is the matter settled and the UCI’s rule change the final word? …. I meant I agree with BC. +1 Bring back the “fog of war”! Happy New Year! What about keeping the radios and having the coms between riders and DS as part of the TV coverage? This will never fly. In the heat of the moment, at the height of the action, it would be impossible for riders and DSs to keep their public persona intact. And, they shouldn’t be expected to. Additionally, to open a window into team thought and team method would not work. You proposal would be the best way to get teams to abandon the (race radio practice) voluntarily. Sporza already do this with their in-car cams for the classics coverage. We see team managers swearing, riders swearing, mechanics swearing and more. It’s not the radio but from the team car but it means all radio coms are included, whether the DS operating the radio or the crackling sounds from riders radioing news. I don’t think continuous bad language does much for the image of the sport. It is also an unfortunate insight into the type of people who are running some WT teams. All team managers and directeur sportifs already have tried and tested methods of communicating with riders without radios as all World Tour teams ride in Continental circuit races. It’s hard to isolate the World Tour races from the others. The higher the level the more locked down a race is but is it the radios or just 18 teams keen to control a race rather than, say six World Tour teams vs 15 others who need to provoke the race to have a chance of winning? Race radios are just a technological evolution of the sport. For sure, it changes the way the race is run, but to argue that it should be banned because it makes racing dull is illegitimate because it adds a layer of safety and control for the riders. And with no contrary arguments other than commercial or thrill aspects, then the riders should have their way on this one. Motorcycles “are just a technological evolution of the ” bicycle, but they don’t allow riders to use them. The safety argument is pretty weak. I remember comments from riders in LeTour on the stage where the team bus was stuck under the finish-line gantry who knew NOTHING of the situation, despite having radio earpieces. The Orica Bus was more an issue from the organizer. They changed their mind 3 time before settling for a decision. I’m not following your reasoning here. Whether the organizers changed their minds 3 or 10 times, the guys didn’t seem to have a clue that the race finish was blocked by the bus. They got NO information about this via radio earpieces, so were clueless when asked by the TV folks about the controversy. To me that puts a real dent in “we need radios for safety” argument. In some ways I’d claim they may even make things worse when the DS (assuming the radio works) orders his riders to “get to the front!” at the same time all the others do, making for more dangerous conditions instead of less. +1 Larry T. for that one. The safety issue goes both ways, in fact. Remember: No one else hears what’s on the communication and if the situation calls for a fast response from the team car it simply leaves the convoy and unexpectedly rushes forward. This endangers everybody in the convoy and as a commissaire it is impossible to assert the situation and react as I don’t know what is going on. Well, at WT level, the drivers are pros, yes but still it is a problem in narrow roads where moving forward is not an option but done anyway. I am angry at your not putting the “thrill aspects”, that is, the special value of the sport, at the very top of your priorities. BTW, Is that the legendary Phil Anderson with earpiece and ponytail in the Motorola duds? Didn’t know he ever rode for Mototrola? If safety is the issue, it could be solved by one-way radios handed out and operated by the race director. Let’s see then which rider still thinks it’s a “safety issue”. 110%, “safety issue” is a red herring. Yes that’s him. Had a good season with them. Pretty sure Phil was in the original Motorola team when it was set up. Not sure of his role though. If he wasn’t riding GC then he was Super Domestique or Road Captain I think. Possibly a precursor to live on-screen rider data? Tubulars slung over the shoulders to follow soon. 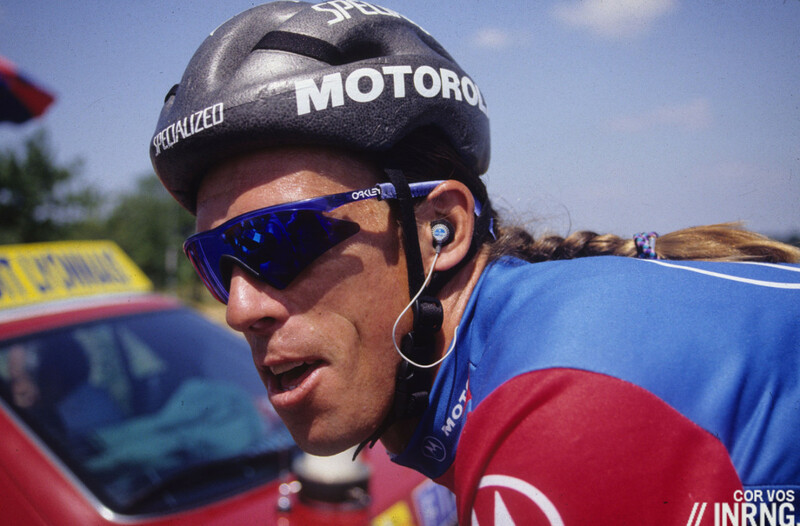 Race radios provide a separation between professional cycling and people’s ability to relate to their own experience (less now with ubiquitous iPhones and all-too-common ear-buds, but still it diminishes the individual aspect of the sport). But the same can be said for support vehicles. Will we see a move to ban team cars from the race next? That would have the same effect as race radios: put in another factor than the physical and tactical talent of the individual riders. Well, the goal would be to promote mechanical reliability, to increase rider safety by reducing the proximity of motor vehicles, and to open up roads which are currently off-limits due to the requirements of the race caravan. But the days of being able to fix your own flat then make it back to the leaders may well be past, especially without the team cars for off-the-record drafting and sticky bottles, with the greater pack coherence of modern racing versus the war of attrition of the “epic” days when time gaps were far larger. You certainly don’t want a situation where any flat is basically disqualification. 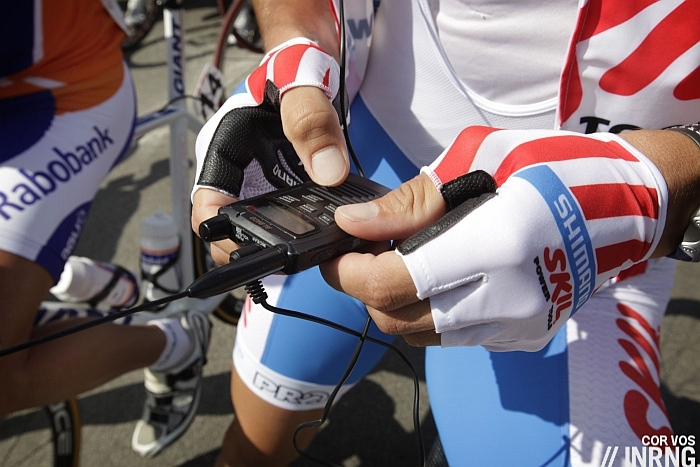 To those opposed to race radios, have you ever talked to the riders and asked their opinion ? ALL the riders I have spoken with, want radios for safety and tactical reasons. Very difficult to go back to team cars and then back to the peleton to convey safety information. This assumes the riders are the best judges of the long-term benefits of various rules – like the helmet rule they went on strike against as well as all those anti-doping efforts they’ve protested against over the years. If safety remains a concern for teams and riders then why not keep a one way system – riders to cars or DSs? I’m all for improving and revitalising racing but doing it at the expense of rider safety, when concerns over travel, racing days etc are still rife, seems a little wrong to me. Couldn’t rider safety be accommodated by riders listening to race radio or a variant where the commissionaire is able to give out information? Am I missing something here? Well, I remember Chris Horner saying how once he got flipped over and landed in a ditch on the side of the road, and the only way he got out of there was because he could use the radio to call the team car to help him out. So in that case, his safety necessitated a two way means of communication. I despise radios more than I despise PEDs. The riders you name don’t seem enslaved to radio commands but to power meter readings. I would love to see some actual data that shows whether breakaways are more likely to succeed when there are no radios. If we only considered races where there were strong sprint teams interested in pulling it back together, I suspect the number of breakaway successes in the absence of radios would only be marginally different. In other words, it may simply be a matter of perception that radios are to blame for the more predictable outcomes on these flat days. The peloton is simply more professional than in days of yore and there are strong sprint teams dedicated to making breakaways futile. This is what I was thinking too–without seeing the data or analysis (if any?) UCI are working with, it feels like there’s untested assumptions at play. Then again, a year without race radio on the WT/World Cup level may provide enough evidence one way or another for the pro or anti-side to capitulate. Team bicycle racing, at it’s most beautiful, is a rolling chess game complicated by the variable challenges of terrain, weather, luck, evolving individual physical health, strength and stamina and, by far the most interesting, each piece’s (cyclist’s) tactical acumen. Race radios transfer this facet to the DS(s), who have radios, scouts, TVs, weather reports, etc. as well as proven tactical acumen. Radios dumb the game down a bit. I agree. And of course the decisions made by someone IN the action, exhausted, angry, full of adrenaline or by a neo pro will most likely be different to someone whose job it is to lead a team, to think about tactics and who has a whole set of informations the riders don’t have. From a teams pov racing without radio must be horror, they want to have as much control as possible. And maybe some riders are happy with that, too? The responsibility isn’t theirs and they can point to the car if a tactic doesn’t work out? In other sports coaching during the game is forbidden or restricted. I would love to see that in cycling, too and would be happy if we get rid of race radio ( in the form of communication between a team and it’s riders). The breakaway can get much of the information they need without radios. There is always a motorbike displaying the time gaps and am I right in thinking that if the gap extends to more than 2 minutes the team cars are allowed to move up past the bunch? The rest of the peloton will then be aware of how far the break has gone and also the DS/team cars can then talk to the riders directly. As far as “Tactical” use of radios: Riders should not be some automatron that just responds to a DS commands. Let them think and react for themselves. It is part of racing and should be. Let the domestiques relay information when they pick up water bottles, time boards on the motos, etc as it has been done for decades. On keeping the radios for safety, this is BS. Set up a separate feed where EVERYONE gets the same information (multiple languages on multiple channels). A filtered version of race radio. Neutral party would broadcast safety issues, road furniture, crashes, breakaway times, etc. Boycott the first “big” race of the year (TdU) and all good. Teams will also save a lot of money. If they need them for so called safety reasons, then let the leader on each team keep one then that info can be relayed by the team helpers. Better still make sure it’s a big 1980’s style device. If safety is such a concern, why are radios not used in Junior and U23 races, where the roads are much narrower and less well secured?!? Bad argument..
Ban the radios, make the team sizes smaller and racing will be much more unpredictable! I’d find it absolutely unresponsible if the teams don’t follow the rules. When riders don’t follow the rules everybody goes berserk, but if teams do it, it is for “the sport”? No way. So if the teams really want cycling to be credible, they use the legitimate ways they have and if those are not enough, they work on getting bigger voices in the decisionmaking for the rules in the future. For me this is the question: Do the teams only follow rules if they are good for them or are they serious with taking the sport serious (and how much do they care how they look in public or- if they really go on and break the rules and hijack a race which people worked hard on making it happen for their own interest-do they think the fans have forgotten about it by the next race anyway, in other words: Do they take us serious or do they think we are satisfied with a few nice sounding words and polished pictures?). And if safety really would be what the riders and teams are concerned with, I would think that instead of showing muscles, they would get in talks with the UCI to find a compromise, because there are other ways to ensure that (some already mentioned in these comments). If I agree to be part of something, I have to respect the rules and can’t decide myself which ones I like/follow and which I don’t like. This is a colossal invention. Nothing changes in 2015. The UCI has not only changed in 2015 to 2014. The difference this time is that UCI’s management committee kept giving an extension to the situation, ie they’re allowed in World Tour races. Now they’ve approved the last set of rules which state they’re banned and there’s been no update. It’ll probably come to a short clash and the teams get to use the radios but it’ll be interesting to see if Cookson is happy to back down. has you could easily verify no change in 2.2.024 rule for 2015. Exactly, so the current set of rules – the excerpt illustrated above – won’t be changed and so, on paper at least, the radios are banned. Whether the UCI stick to this or make a new amendment is the interesting bit. 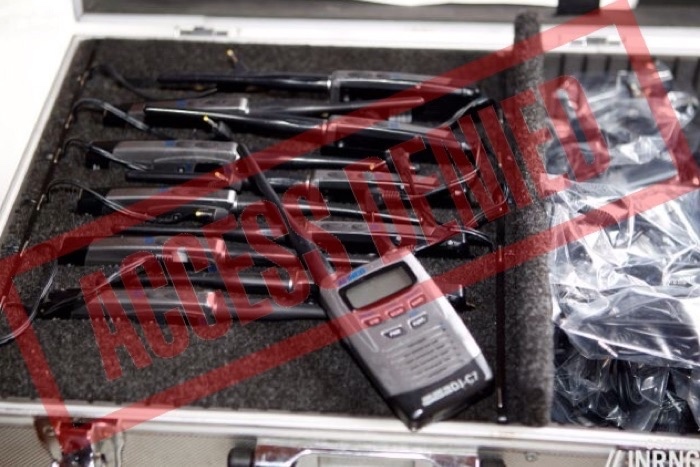 Let the riders keep the radios, but don’t let them talk to their DSs. Instead let them hear the race radio and be able to report back if they need to notify the officials of safety concerns. Then safety is completely covered and riders would still be able to hear what the time gaps are, but they will have to think for themselves (or a teammate). Best idea I’ve heard about radios in a long time. Can someone please put my curiosity to rest and tell me who the rider with the ponytail in the Motorola kit is? It is, that was my guess but I thought that race radios were not around till after his retirement. Just goes to prove the point really. Thanks. That’s the legendary Phil Anderson in the Motorola kit. Plenty of comments on the pros and cons of radios rather than the politics or a ban or likelihood of it happening. This post you link (which perhaps I had a vague memory of) supports my stated suspicion above. Radios don’t make for more boring racing re. breakaways being controlled and caught more often and more easily. I do think radios might make for a generation of riders who tend not to gain tactical nous of being able to read the race well for themselves but maybe this has always been a rare trait amongst racers historically? The ‘politics’ of this issue are certain. An uncertain number of self serving team managers/owners are going to oppose/threaten the idea of radio bans, using safety as the central point of their objection. There is a simple solution to the safety issue if that is what really concerns them, already expounded by earlier posters, this simple solution will however be ignored. Their real reason for keeping radios is to enhance their own self serving image and interests, by being seen to control races. The UCI runs the WT, and one of the requirements of membership is that all WT teams compete in all WT events. The solution should therefore be simple. If teams are going to refuse to compete – and I use compete in the broadest sense, then they should lose their WT licence. These characters/chancers will happily disrupt other people/sponsors events without a second thought to obtain their own self serving ends. This attitude alone tells us something about the sort of people we are dealing with. I have little reason to support the UCI, except to accept they are the sports governing body. Rules are rules, picking and choosing which rule to support should never be an option. I fail to see how teams and managers can think it is a good idea not to return to radio-free races. But I clearly see how teams and managers are bad for cycling races. They spend millions on their riders. They’d want some chance in a race to direct them. INRNG, with respect, they spend other peoples millions on their riders ! Of course, but managers want to manage. Chauffering the mechanic and passing up bottles isn’t as good. Are Lefevère and Vaughters putting any of their own money in the sport? Anyway it doesn’t really matter… Cycling races are basically for fans to enjoy and follow, not for managers to tele-direct their riders. Race organisers should stand up, because they own the only thing that is permanent in this sport, the only thing thing that is “capital”. All of these team managers should go home, and all sponsorship money should go to races. Riders should live on prizes, and entry fees here appropriate. Like any manager in sports they want to influence their athletes on the field of play. They should stop the stage half way through for a 10 minute break, half an orange and allow the DS to give the team the hair dryer treatment. With current technology I imagine the radios could be programmed to be 2-way but segmented such that the officials can communicate to the riders for safety, the riders can communicate to their cars in case of mechanicals, but the cars can not talk to the riders. I am wholly in favor of limiting the current calculated-in-the-car “go X km/h for the next X km and you’ll catch the break at the 3k banner” racing. Without race radios, Passo dello Stelvio would not have happened. Am I missing something. TV coverage hass not lessened due to radio’s. So what is the UCI’s current reasoning for the rule? That’s because races are doing what they can to stay interesting, in order to counter the controlled boredom emanating from the DS in their cars. Flat stages are becoming rare, because DS have managed to make them wholly predictable. Let’s hope the end of radios is followed by the end of sprint trains and the end of pure sprinters as star team leaders, so that flat stages have room for brakaways, chacal attacks, unexpected GC action, and what used to make the TdF’s first week so interesting. I’d love to see Froome race without radios, and exploit that crazy vein he has, which makes his whole appeal, and that seems a little stifled at Brailsford’s. I do not like the stone set opinion of the two quoted team managers. Indeed, I hope to see them defied. Why can’t I see the Twitter feed (or whatever it is) at the end of the article? All I get is two parallel grey lines. If the race radio ban goes ahead, shouldn’t TV monitors in team cars be banned also? Excellent point! If someone wants to argue about safety, having a guy at the controls of a car distracted by a TV screen should rank up there on the list of things to avoid. I think of the famous episode on LeTour’s Ventoux stage where a DS watched a TV in the car while talking to an infamous “trainer” via cell phone while advising his rider via radio earpiece on tactics based on what the “trainer” was saying while watching his own TV in another country. Pro cycling doesn’t need this kind of technology any more than it needs hidden electric motors in the seat tubes of the bicycles. As well as the safety issue, I was thinking simply that if there is no TV information being viewed then there isn’t anything then to convey via radio to the riders. Surely one follows the other. Has anyone done a analysis of TDF crashes before and after race radios were used? I’d be curious to see those numbers. Personally I find racing rather boring to watch these days… at least grand tours. Kinda like horse racing. The UCI has done an analysis of crashes, the idea being that the Tour de France in particular has seen huge crashes in the opening week. Radios were one hypothesis, that DSs were insisting riders must get to the front… but ban the radio and surely every rider would still hear their manager’s voice in their head from the morning briefing: “you must be at the front”. The report also looked at street furniture, the rise of carbon wheels and other likely factors. Sorry. I just haven’t seen the difference in racing with radios and without radios. The fairly aggressive fans in this thread who seem to think they should have a say in this issue–this isn’t a national policy debate and you are not voters–ought to at least actually make the case that racing without radios is “more exciting.” We have data now, which we didn’t have when this issue first came up. So, go back, and analyze all the races and show us that racing without radios is better. As I said, I haven’t seen it. PS. I’m not going to reply here to anecdotes. I want a full review of all the racing done since the teams forced the UCI to allow radios in WT events. There are plenty of sites where you could post such a review. I would suggest that more riders are put in danger by PED’s then not having access to radios during races. PED’s are not allowed yet riders choose to use them. They ride as pros, pro teams agree to race under controls via rules their they should abide by those rules. For anyone subscribed to the comments, see the update in the piece above: radios will be allowed. The UCI have been in touch to say the rulebook will be updated early in the new year. what a crock of #@$% this post turned out to be. Hey, try this scoop: Race radios banned in 2016!! It’s true! The wording of the revised rules will imply radios banned in 2016!! Oh, 2017 you ask? Banned!!! Sorry for those set against radios. Seems the UCI can’t afford to upset team managers as it tries to get them to sign up to reform plans. No “scoop” though, the rule had been public on the UCI website for three months. After quoting it in the Christmas quiz piece last week I thought it was worth highlighting the change. Seems a few alarm bells rang in Aigle and we will get a fresh update soon. Jeez, these anonymous comments are getting rather aggro aren’t they? Go drink some water and stretch your legs, folks. Oh well; great blog post, regardless. So Inrng is running the UCI after all? Just as I suspected. Yes, it is highly suspicious about the timing of Inrng’s post and the UCI’s change in position. Probably the UCI avidly follow this blog site, just like the rest of us! And Happy New Year to all (road) cycling fans out there in Mr. INRNG’S cyber universe! Oh well, I guess there is no Santa Claus. Changing the direction of the ship that is pro cycling before it totally runs aground is far from easy, even for Cookson. Had lunch with another Italian recently who told me he no longer cares about pro cycling after years as a big fan. The sport has lost all credibility in his view, he believes they all dope so no longer cares to watch. Fans comes, fans go. I’m sure you could find similar fans, disgusted and abandoning the sport they had loved, after the introduction of derailleurs in the Tour in 1937. And cheating has always been a part of the sport: you can read about the riders spreading tacks and hopping on trains in the 1892 Paris-Brest-Paris, for example (see the recent Bicycle Quarterly for a great article on that race). Fair enough, except more fans seem to be going than coming these days. 17 teams battling for 18 World Tour spots while long-running races become extinct for lack of funds kind of suggest this. As to cheating, just because you think it’s always been part of the sport, does that mean nobody should care about enforcing the rules? What is sport without rules? I think the World Wrestling folks call it “entertainment”? Happy New Year to all! Let’s be clear: Cheating has always been part of EVERY sport. Larry T. gave the correct response to your statement if you take the trouble to read his words. How about banning powermeters and computers? Wonderful for training but they do take some of the brainwork out of a race situation. Plus, its not like any of the telecasts make much use of all the data.